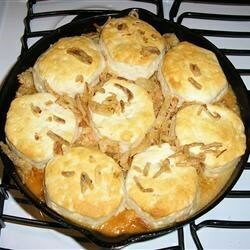 "This casserole is easy and yummy. You can substitute tuna or salmon if you like." In a 2 quart casserole layer the beans, crab, 1 teaspoon flour, cheese and all but 1/3 cup onion rings. In a small bowl mix together the soup and milk; stir in remaining 2 teaspoons flour and pour mixture over casserole. Bake in the preheated oven for 10 minutes or until bubbly. Arrange biscuits on top of casserole and bake for another 20 minutes, adding remaining onion rings in the last 3 minutes of baking. See how to prepare the easiest “fancy” fish recipe of all time. I love this recipe! This is a simple recipe that adds a unique touch to my weekly menu. No one in my family liked this. It was not good at all. The ingredients all clash with each other. My family did not find this to be a very good meal at all. This was surprisingly good. I think it would be best with crab meat ( I used tuna). And maybe less milk. It doesnt have the best look, but the taste makes up for it. I'll use this again. I never rate anything w/ a 5 but this recipe is an exception! My kids frown at seafood - but they loved this recipe!! It's delicious and easy to make!! I love it!!! This recipe turned out pretty good. My husband said he'd eat it again, which is pretty high praise and I actually ate the leftovers for lunch, so that says a lot.